Norma Jean Lollis Hill was an eyewitness to the assassination of United States President John F. Kennedy in Dallas, Texas, on November 22, 1963. 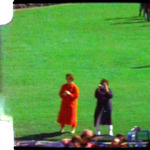 Hill was known as the "Lady in Red" because of the long red raincoat she wore that day, as seen in Abraham Zapruder's film of the assassination. A teacher by profession, she was a consultant for Oliver Stone's 1991 film JFK and co-wrote JFK: The Last Dissenting Witness with Bill Sloan. Many of Hill's claims have been both disputed and embraced. While official sources have considered her an unreliable witness for a number of legitimate reasons, other researchers investigating the assassination and the conclusions of the Warren Commission consider her a highly credible witness. Critics point to her statement that she saw Jack Ruby, the killer of assassin Lee Harvey Oswald, at the scene of the assassination in Dealey Plaza when other witnesses placed him in the offices of The Dallas Morning News at the time. Others point to significant circumstantial evidence of an apparent smear campaign to undermine the testimony and credibility of Hill, the closest civilian witness to the assassination and its immediate aftermath.